News reports from Berlin are reporting the death of the former Grand Duke Ernst Ludwig of Hesse and By Rhine, who died earlier today at his hunting lodge, Schloss Wolfsgarten, near Darmstadt. The Grand Duke was 68 years old. Death "followed an attack of influenza." The former Grand Duke was the eldest son of the late Grand Duke Ludwig IV and Princess Alice, second daughter of Queen Victoria. He was the brother of late late Empress Alexandra of Russia, consort of Nicholas II, and the brother-in-law of the late Grand Duke Serge of Russia, Prince Henry of Prussia (also his first cousin) and Prince Louis of Battenberg, He was said to be Victoria's favorite grandson. Until November 1918, Ernst Ludwig ruled Hesse and By Rhine, a territory about "one-third the size of New Jersey," according to the New York Times. His main residence was a "luxurious palace" in Darmstadt, where he was born on November 25, 1868. After his abdication, Hesse became a free state in the new German republic. After :many years of litigation," the former Grand Duke won an annual income of $400,000 from Hesse. He was a patron of the arts. The late reporter, William Bayard Hale, once called the late grand duke a "wise ruler and an able statesman." After he abdicated, Ernst Ludwig "abjured politics and made no effort to regain his throne." Ernst Ludwig married twice. On April 19, 1894, he married his first cousin, Princess Victoria Melita of Edinburgh, a match that had been encouraged by their mutual grandmother, Queen Victoria. It was not a happy or successful marriage. Victoria Melita gave birth to a daughter, Elisabeth in 1895, who died of typhoid at age eight. She gave birth to a stillborn son in 1900, a year before the couple were divorced. He married for a second time in 1905 to Princess Eleonore Solms-Hohensolms-Lich, who survives him. 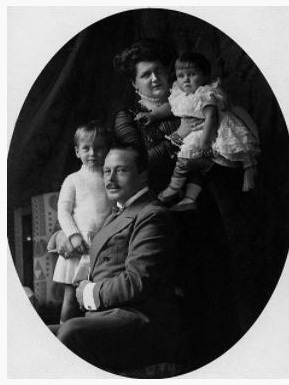 He is also survived by their two sons, Hereditary Grand Duke Georg Donatus, 30, and Prince Ludwig,29, and three grandchildren, Princes Ludwig, Alexander and Princess Johanna. Hereditary Grand Duke Georg Donatus is married to Princess Cecilie of Greece and Denmark, the third daughter of Princess Alice of Battenberg and Prince Andrew of Greece. Princess Alice is the late Grand Duke's niece. Ernst Ludwig is also survived by two older sisters, Victoria, Dowager Duchess of Milford Haven, and Princess Irene, the widow of Prince Henry of Prussia. His younger son, Prince Ludwig, is engaged to marry the Hon. Margaret Geddes next month.